Neat event coming up on Saturday, November 22 at the Tewksbury Public Library. 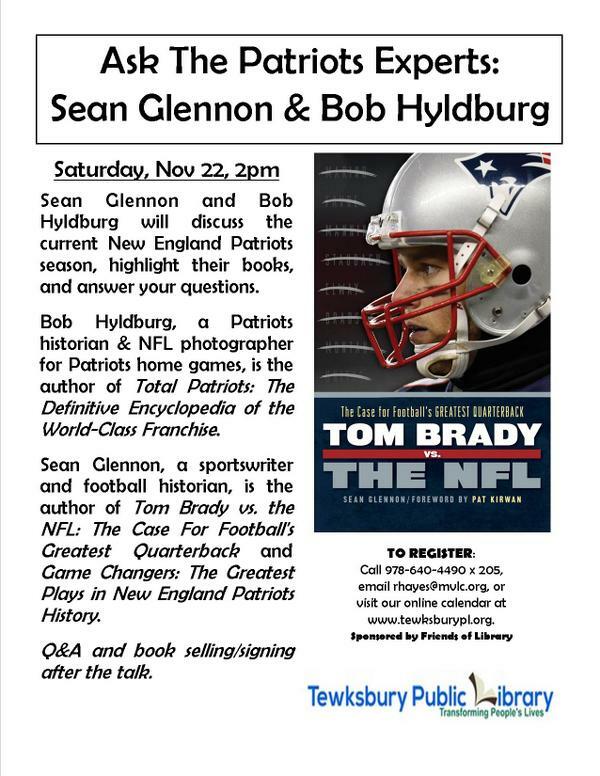 My pal and fellow Patriots author Bob Hyldburg will be leading a discussion on Patriots past, present and future. Bob, in case you don’t know, is the author of the completely amazing volume Total Patriots. Come and talk Pats with us. The event is free and open to the public, though the library recommends advance registration as seating is limited. Bring your copies of our books and get them signed. Or pick up copies while you’re there. Signed books make great holiday gifts. Check in on the event page on Facebook and let me know you’re coming. John Murphy was kind enough to have me on his radio program on Buffalo’s WGR 550 last night. 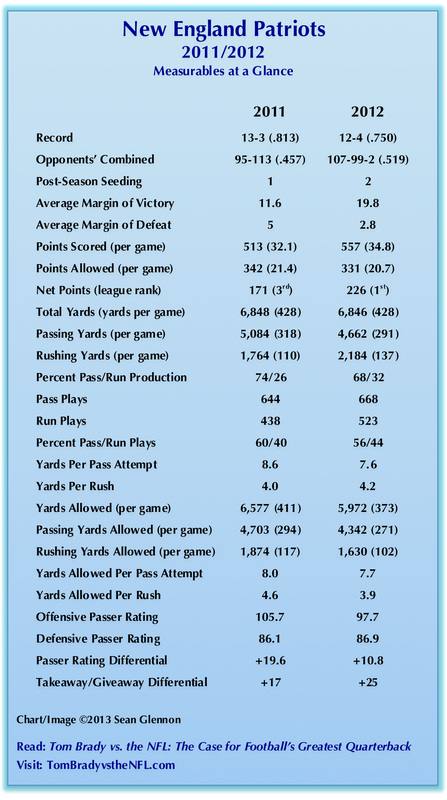 We talked about Tom Brady vs. the NFL: The Case for Football’s Greatest Quarterback, of course, and a bit about my expectations for the 2013 NFL season. You can hear the whole thing here (I come in at the 40-minute mark). Sure, the 2013 NFL season is still 59 days away, but training camp is just around the corner. And, hell, it’s never really the wrong time to talk football. Tonight at 8, I’ll join John Murphy, play-by-play voice of the Buffalo Bills, on his daily broadcast to talk AFC East football and discuss Tom Brady vs. the NFL: The Case for Football’s Greatest Quarterback. You don’t have to be in western New York to tune in. The John Murphy Show streams live via the WGR 550 web site. Take a listen; it should be fun. I’ll be hanging out, talking Patriots, and signing copies of Tom Brady vs. the NFL: The Case for Football’s Greatest Quarterback at the Barnes & Noble store in Framingham, Massachusetts Saturday, January 19 from from 11 a.m. to 2 p.m.
You should come by. We can jaw about the playoffs. 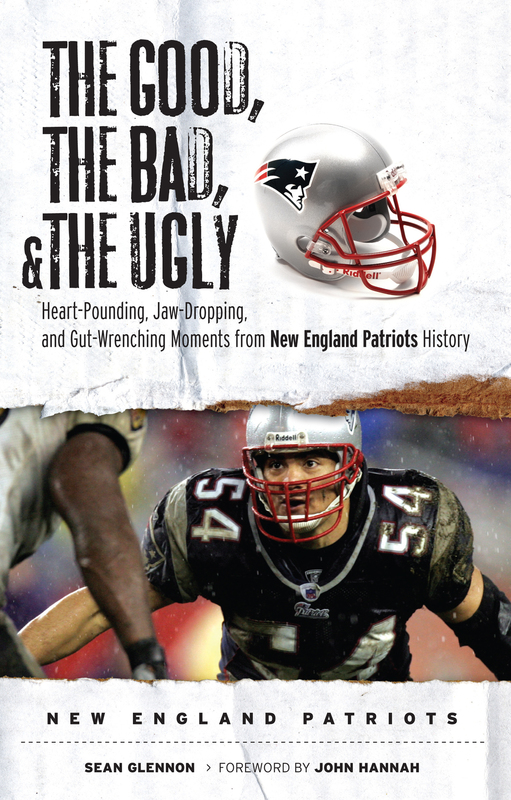 And you can pick up a copy of the book and discover for yourself what Kevin Braig of Cold, Hard Football Facts and Steve Balestrieri of PatsFans.com like so much about it. Sure, the winter holidays have passed by. But Mothers Day and Fathers Day are both on the horizon. Birthday’s happen, too. So if you have Patriots fans in your life (you must), remember that a signed book makes a great gift. 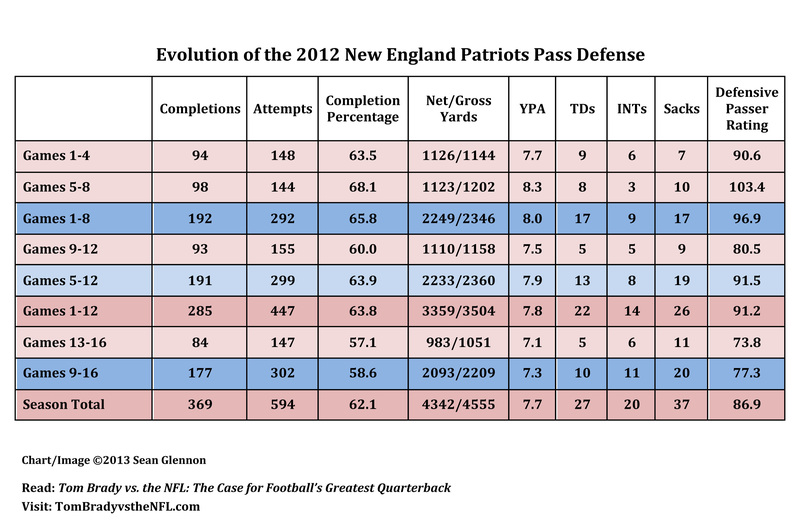 Because I apparently have a pathological need to prove my own geekiness, I put together a little chart that illustrates the progression of the 2012 New England Patriots pass defense by way of some key measurables (which is to say statistics). Go ahead and share it with your friends. You know you want to. I’ve been hearing via Twitter from a lot of folks who got a copy of Tom Brady vs. the NFL: The Case for Football’s Greatest Quarterback as a holiday gift, which is really neat to hear about. And it got me to thinking about how I can give something back. 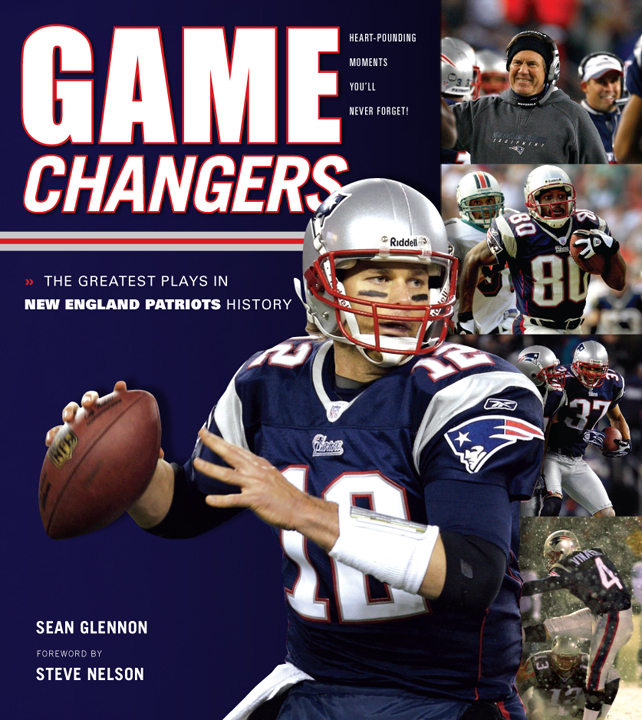 Between now (Wednesday, December 26 at 1:40 p.m. EST) and kickoff of the first Patriots game of the 2012-13 playoffs, everyone who tweets something they like about or from Tom Brady vs. the NFL and tags me (@SeanGlennon) in that tweet will be entered into a drawing for one signed copy each of Game Changers: The Greatest Plays in New England Patriots History and The Good, the Bad, and the Ugly: Heart-Pounding, Jaw-Dropping and Gut-Wrenching Moments in New England Patriots History. One winner will be drawn at random from all entries submitted. Winner will be announced via this web site and my Twitter account. This prize package has no cash value. Positive press for for Tom Brady vs. the NFL: The Case for Football’s Greatest Quarterback continues to roll in. So that’s pretty flattering. Now go and read the whole thing. 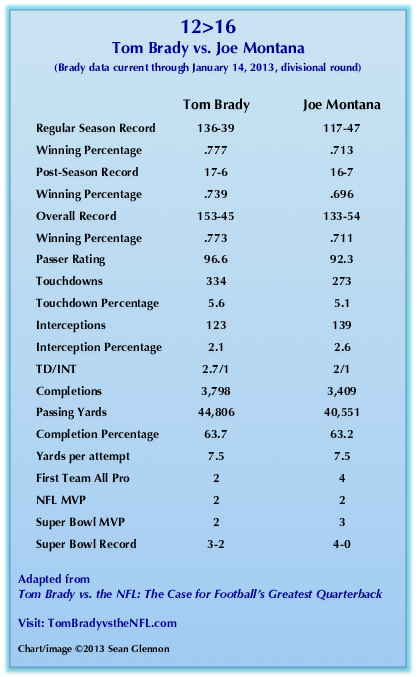 More positive media attention for Tom Brady vs. the NFL: The Case for Football’s Greatest Quarterback. Steve Balestrieri, who continues to be far too kind to me, came out to Barnes & Noble in Millbury, Massachusetts Saturday afternoon to interview me and take some photos during my signing event there. From that, comes this neat feature. And this morning, I joined Karlson & McKenzie on Boston’s 100.7 WZLX to talk with Kevin and Pete about the book, Brady and the Patriots. You can check out a podcast of that interview right here if you’re so inclined. Coming up later this week, I’ll be joining Ryan Matlack and Kyle Pilazzi on 1450 The Hall’s Back To The Minors Wednesday, December 12 at 5:45 p.m.
Got a TV thing coming up over the weekend, too, but I’ll wait to make sure the taping happens as scheduled before getting into details.